In the first part of this two part series of articles, we looked at how relatively cheap and easy it was to get your child up and running in the game of golf. We looked at how you can buy a small amount of equipment relatively cheaply and then how the child can start to use this equipment, without costing you a fortune in range balls, course fees and the like. 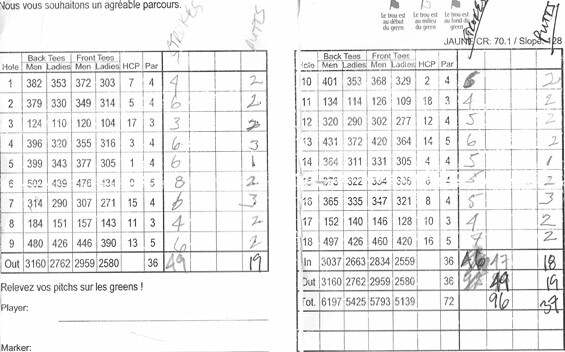 We left off the last article with the child practicing at the local public course practice area, hitting plenty of balls to gain an elemental degree of control and mastery of the clubs. Once your child can hit the ball from the tee and off the floor with a relative degree of success (by no means do they need to do it every time), they’ll no doubt be wanting to test their skills on a golf course. 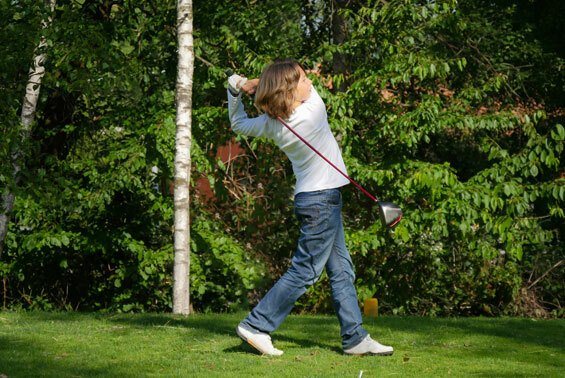 Very quickly after they learn to hit the ball relatively competently, you’ll likely find your child wants to put their skills to test on a course. My son, when he went through this process, hit his driver 150 yards and then immediately felt he was now ready to challenge Rory McIlroy and that qualifying as a pro would simply be a formality. Of course, it’s still too early at this stage to get them on a full-size 18-hole course but many places have small Pitch and Putt courses of holes from 50 to 150 yards in length. These are ideal for newbie golfers (and they are a perfect chance to sharpen up your short game too). This allows your child to put the skills they have learned into practice. But don’t be overly officious with them. Allow them plenty of ‘mulligans’ but explain that in real golf, that a mishit would count as a shot. Also do take time to explain the fundamentals of etiquette too, about not standing on players lines of putt, keeping quiet while people take their shot. Children are never too young to learn these basics. By playing on these pitch and putt courses a child will learn the difference between simply hitting the ball, and making a golf shot. It’s a subtle difference but one that is important to learn. It is also here they will discover the value in using different clubs for different shots. They’ll also gain their first real experience of what it is to play on a course and, with any luck, they’ll be bitten by the golfing bug. With plenty of encouragement, you are now putting the rudimentary skills in place for your youngster to start to think about the game more seriously and now it is time to visit the range and the local golf pro. I’m very wary of throwing a bucket of 100 balls down at the feet of a child and giving them a chance to hit it. I think that this is so repetitive for them, it quickly becomes boring and what you’ll find is that your child hits 98 shots with the driver (because it goes furthest) and then uses the other two clubs in his bag once apiece. Instead, I think a great place to start is with the local pro. Ask him about lessons, or better still, group lessons for your child. These may take place during the week, or in the school holidays. There will likely be a small fee involved, but this is a chance for your child to develop more than simply the ability to hit the ball, but learn the fundamentals required for a good golf swing. A golf pro will be able to assess the level of ability your child is at and recommend the best course of action for them to develop. This is, of course, entirely dependent on the child and their ability. Alongside any lessons or camps your child attends, it is also important to give them regular practice time. If you are at the range, then hitting balls is a good idea, but do mix it up and get them into good habits early. Get them hitting 5 balls with each club, Looking at how far they hit each club, play nearest the pin games and of course, keep them working on their bunker play and putting. It doesn’t have to be intensive, but alongside professional golf instruction, practice is the key to make your child not only improve, but enjoy golf a whole lot more. All children progress at different rates so it can be difficult to judge when a child is ready to play on a full sized course. There’s also the matter that for younger children, 18 holes of golf is an awful lot to ask. As such, 9-hole courses, especially those that consist of full sized par-3 holes are an ideal solution. They are a ‘proper’ course, but a shorter version that is more suited to a player who cannot thrash a driver 250+ yards down the fairway just yet. There are some outstanding 9-hole courses around that offer all players of all abilities a real challenge, but remember to keep it fun. Allow your child to play from the women’s tee if they find distance an issue on some holes and use common sense. If there’s a hole requiring them to hit 100 yards over water, it may be more prudent to allow your child to drop a ball on the green and putt for par, than risk them losing 10 balls and their temper. Once your child can play these shorter holes with confidence and continues their practice and lessons, it will not be very long before they are ready for their final test. It’s difficult to say when a child will be ready to play a full 18-holes. It is certainly not an age-related issue as Rory McIlroy and Tiger Woods could play 18 holes without a problem from an extremely young age, while kids just starting in golf aged 15, 16 or 17 may still be some time away from being ready to play on the course with any real hope of shooting a score. In truth, you will likely both know when you are ready and indeed, if you are in contact with a golf pro, they’ll be able to tell you when they think your child is ready for the challenges of a full-sized course. It’s a good idea to make the first few trips to the course as stress free as possible. Pick a quiet day when the course is likely to be relatively empty and pick a time of day when you are not likely to have a queue of groups of players lining up behind you. Sunset tickets are a good idea as not only are the courses much quieter, it is also considerably cheaper and even if you don’t finish the entire round, the experience of playing 9 or 12 or 15 holes on a full sized course will stand them in good stead. Many clubs also offer great low rates for child members, so this is something you could look at with your own club, especially if you are already a member. One of the beautiful things about golf is that it is a hobby your child can enjoy both with their friends and with you. The in-built handicap system makes playing against anybody, even those children with disabilities, perfectly feasible. Better still, if your child doesn’t excel at sports like football, rugby then golf offers a more sedate and cerebral alternative, getting them out of the house to enjoy the local countryside and to indulge in a game that can become a life-enriching hobby. If you’d like any more information about how to get your child into golf, drop GGB a line in the comments box below and we’ll do our best to help you out!